If you’re a prospective student, navigating all of the different financial aid options available to you can be confusing. Luckily, there many resources available to help make your healthcare education affordable. In fact, every year, the federal government awards over $120 billion in federal grants, loans, and work-study funds to more than 13 million college students. For many students, financial aid is one of the primary resources that make higher education possible. At Ameritech, we understand that the prospect of paying for college can be intimidating, but we’re here to help! We’re committed to making college accessible and affordable to anyone who wishes to pursue their degree. That’s why financial aid is available to qualifying students for all of our programs. Our financial aid department consults personally with every student to help educate you about your financial aid options and the process of applying. Ultimately, we hope to make sure that our prospective and current students are equipped with the knowledge they need to make the most of their financial aid options. With that in mind, we’ve prepared this helpful post to walk you through the potential resources available to help you pay for your healthcare education. Related Resource: Who Qualifies for Financial Aid? Whether you’re seeking financial aid for nursing school or one of our other healthcare programs, the best place to start is completing the Free Application for Federal Student Aid, or FAFSA. Based on the information you report, the FAFSA determines the amount and kinds of government assistance you qualify for, as well as how much you can be expected to contribute. Even if you’re not sure what program or school to choose just yet, it’s a good idea to submit your FAFSA form early, as it’s a great way to get a sense of your total financial responsibility before you apply to a particular program. Luckily, thousands of schools accept federal financial aid and you can list up to six colleges on your FAFSA form, who will all receive your financial aid eligibility information. Even more importantly, federal financial aid is available on a first come, first served basis. That means that, while you can submit your FASFA anytime between January 1st and June 30th, the sooner you complete it, the better. To complete the FAFSA application, you will need to have specific information on hand, including your financial records, social security number, school codes, and more. Before you apply, consult this helpful checklist to make sure you have everything you need. While filling out the FAFSA can be complicated, it’s well worth your time, as this single application will connect you with most of the resources you’ll need to finance your education. If you’re already an Ameritech student, scroll down to part three of this blog post for more information on completing your 2019-2020 FAFSA. Otherwise, keep reading to learn more about the different types of financial aid available to help you pay for your education. Grants are a great way to help finance your healthcare education because they don’t have to be repaid. Grants are typically determined based on your financial need, and the amount awarded depends on your financial situation. Grants can be used to pay for tuition, housing, books, transportation, uniforms, and other costs. When you complete your FAFSA, you will be considered for a range of grants offered federally and in your state of residence. You can also research specific grant options that you may be eligible for, like those available to international students, women, single mothers, minorities, and many other groups. You can search for grants based on factors that apply specifically to you, or check to see which grants are available by state. Like grants, scholarships do not need to be repaid. Unlike grants, scholarships are generally awarded based on merit or good grades, not financial need. Check to see if the school or schools you’re planning to attend offer any school-based scholarships that fit your specific situation. In addition, there are many scholarships available for nurses and students specializing in healthcare. The NURSE Corps Scholarship Program provides educational funding to nurses who, upon graduation, practice for two years at facilities with a critical shortage of nurses. You can research scholarship options by exploring lists specifically dedicated to nursing students or healthcare students, or check out websites like fastweb.com and scholarships.com. Need help? Consider meeting with the financial aid representative at your chosen school for guidance. At Ameritech, we’re here to help our students find all of the grant and scholarship opportunities available to them and can advise you on how to apply. Unlike scholarships and grants, student loans do need to be repaid. Loans also accrue interest over time, so we recommend first checking out the scholarships and grants you may qualify for before applying for a loan. Since you’ll be repaying a loan for years after completing your degree, collect as much information as you can about the loan, including the interest rates and deferment options, to make sure that it’s a good fit for you. You’ll find more information about the different types of loans available below. Financial aid experts will advise you to research federal student loans before applying for private loans. That’s because federal loans generally offer lower interest rates, and don’t have to be paid back while you’re still in school. Instead, you typically have at least six months after graduating to start paying back your student loan. The government also offers options for you to defer payments to a later date, temporarily lower your payment, or consolidate your loans. There are two types of federal student loans: 1) subsidized loans (where the government pays for any interest that accrues on the loan while you’re still in school), or 2) unsubsidized loans (where you’re responsible for any interest that accumulates on the loan while you’re still in school). Originally called Parent Loans for Undergraduate Students (and now simply called Parent PLUS and Grad PLUS loans), PLUS loans are available to the parents of undergraduate college students or to students enrolled in graduate or professional schools. Unlike most conventional loans, PLUS loans don’t require a minimum credit score or low debt-to-income ratio for approval. However, borrowers do need to have solid credit histories and they can’t owe more than they want to borrow, unless they get a cosigner for the loan. Private student loans are offered by banks, credit unions, and some schools—and are an option for students (and parents of students) who may not qualify for scholarships, grants, or federal loans to help pay for school. They can also be used to help with additional costs that these other financial aid options may not cover. Private loans more closely resemble personal loans, meaning that your eligibility depends on your credit score. Additionally, the interest rate for private loans is typically higher than federally guaranteed loans for education. As private loans are not subsidized, they may also require you to make payments while you are still in school, with limited options for deferment and forbearance. Ultimately, the specifics depend on the financial institution and loan terms, so if you choose a private loan, make sure that you have a clear understanding of your financial responsibilities moving forward. Your school’s financial aid representative may be able to help. The Health Resources and Services Administration, which is a part of the U.S. Department of Health and Human Services, offers specialized loans for healthcare students studying certain areas of medicine, including nursing, pharmacy, and dentistry. Each loan has its own requirements about accepted areas of study and financial need, so be sure to visit the Health Resources and Services Administration website to learn more about the different loan opportunities that may be available to you. Beyond the loan options listed above, you may also qualify for loan forgiveness programs if you have a federal student loan. Loan forgiveness means that the borrower is no longer required to repay all, or a portion of, the remaining principal and interest owed on the student loan. Healthcare professionals typically work in public service and often qualify for the government’s Public Service Loan Forgiveness Program. There are also many loan forgiveness options available for nursing students specifically—check out these online resources to see if you qualify. If you’re considering a healthcare program other than nursing, there are several loan forgiveness programs designed for other types of healthcare professionals As loan forgiveness programs are becoming more and more common, it’s definitely well worth your time to find out if you qualify for one of them. If you’re a current Ameritech student, now is the time to file your 2019-2020 FAFSA. If you’re receiving federal loans and/or grants and will be a current student after July 1, 2019, remember that you’re required to submit your FAFSA renewal by June 30, 2019. To ensure that your financial aid continues uninterrupted into the next calendar year, we recommend getting started on your application well before the deadline. Access the FAFSA website or use the mobile app. After you log in, check the “Before Beginning a FAFSA” page to make sure that you have all of the documents needed to complete the application. In order to renew, you must have already filed your 2017 taxes. Click the “FAFSA renewal” link and enter the required information. When asked for your school code, enter 016027 for Ameritech College of Healthcare. When given the option to “transfer from IRS” in the tax data section, follow the IRS prompts to complete this step. If this function doesn’t work, be prepared to manually enter your 2017 tax data. Use your FSA ID to sign the FAFSA renewal electronically. Once you have completed these steps, the results will be sent to Ameritech electronically. For most students, no further action is needed, but if there are additional items that require your attention, our financial aid department will send you an email. While figuring out how to secure financial aid for college can feel intimidating, there are many great resources available to make paying for higher education feasible. At Ameritech, we’re committed to getting students into the classroom and on the path to successful careers in healthcare. That’s why our financial aid representatives are always available to help you determine a payment plan that’s manageable for you, assist you in applying for eligible grants and scholarships, and help you find out if you qualify for need-based financial aid. Want to learn more about the programs we offer? 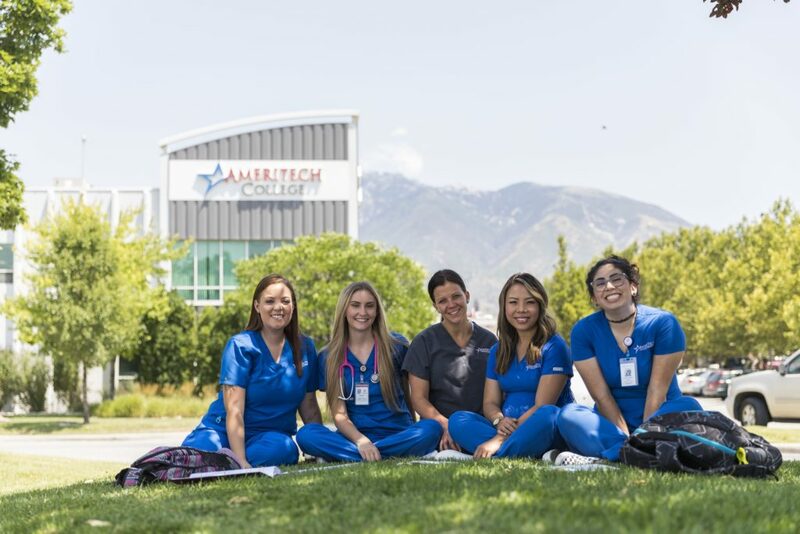 You’ll find more information on our Nursing, Medical Assistant, Occupational Therapy Assistant, and RN-to-BSN programs on the Ameritech website, and don’t forget to follow us on Facebook too!